As you perhaps already know sport betting is indeed very interesting and engaging activity that can potentially be very lucrative if treated carefully enough! We present Bettingmetrics, an excellent tool as a complement to Betamin Builder. It will allow you to perform a large amount of analysis, in addition to professional monitoring of your bets. But before we start with the analysis of Bettingmetrics, we are pleased to announce that we have managed to negotiate with them an exclusive discount of 15% for all our users. Enter coupon code BET19 to benefit from this discount!!! What is Bettingmetrics? What does it offer? Bettingmetrics is cloud based educational platform that aims to cover all sports betting activities in one place. 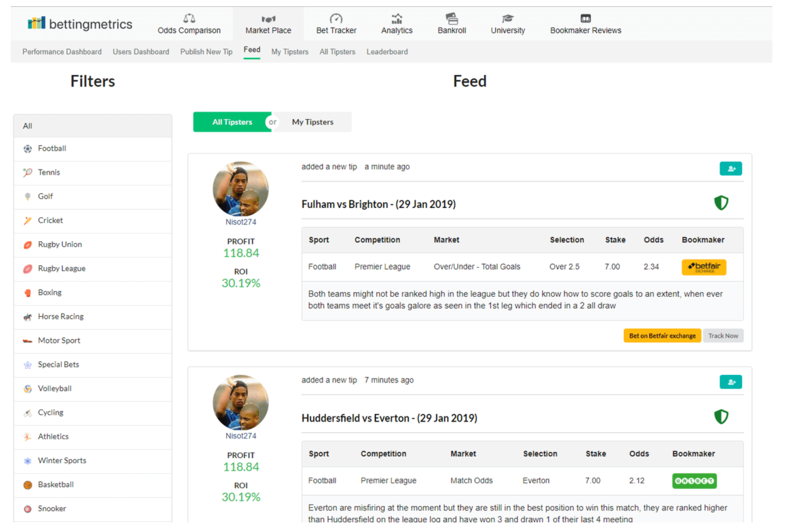 Bettingmetrics platform currently enables punters to compare odds via fast and reliable odds comparison, place bets, buy and sell tips, track and analyse their historical results thanks to automated bet tracker and advanced analytical tools. Bettingmetrics is acting as a social hub where punters can find educational article and engaging betting previews and other information related to sports betting. Bettingmetrics odds comparison is a relatively new feature added to the platform. The goal of the odds comparison is to enable punters to place their bets with the best possible odds. Bettingmetrics odds comparison resolves the issue with slow odds updates. The odds quoted on the site are updated every minute and show the most accurate information. You would also be able to compare odds on live events. Another feature that makes Bettingmetrics odds comparison to stand out of the crowd is the ability to place bets directly from the odds comparison and automatically add them to your bet tracker. Gathering and analyzing your betting history is more often than not, what it will make the whole difference. This is why Bettingmetrics has developed the best in class automated tracker that will help you to gather all of your data in place. Bettingmetrics bet tracker will automate many process and save you a lot of time. 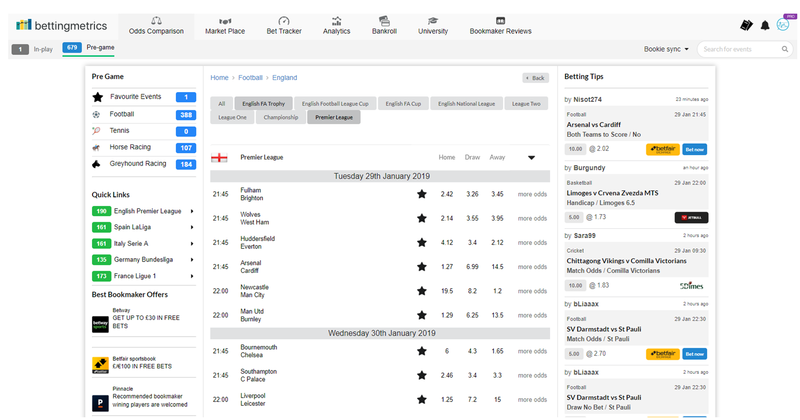 You can track all sports, bookmakers and currencies. You can even track the tipsters you are following. You can track your results either in currency or units mode based on your personal preferences. Further all events tracked manually will be automatically settled for you once the events are finished. You can track single, multiple, arbitrage, lay and in-play bets. Bettingmetrics bet tracker also allows you to track trades and will in fact automatically calculate the correct commission for you. Another great and time saving feature is the ability to sync your bookmaker with Bettingmetrics and automatically import your historical results with zero manual work. They currently support Betfair exchange but more bookmakers will be added soon. In case you have tracked your data with excel but you are as most of the people unhappy with what excel provides you with, you can import your custom spreadsheet and stats using Bettingmetrics simultaneously! As the old saying goes data is worthless if not analysed. This is why the team behind Bettingmetrics applied great effort of building advanced but easy to use analytics. Bettingmetrics developed tools that allow punters to analyse their betting performance down to the deepest detail with one major goal – to improve future betting results based on historical performance. The above counted are a few of the areas you can analyse via Bettingmetrics analytics. You can literally dig down to the deepest details in history analyse and change something in the future based on educated data driven decision. Bettingmetrics team understands how important is the time. 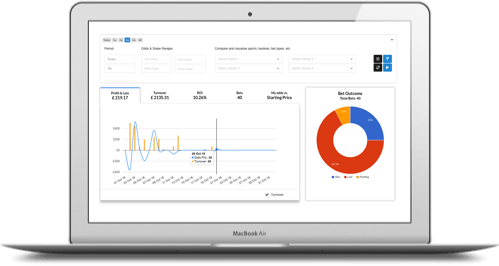 They have recently launched an automated analysis feature which will analyse your data for you, simulate various different scenarios and suggest you how to change your money management strategy in order to get better results. The bankroll section of Bettingmetrics is the area where you can keep track of your financial balance in different bookmakers. Bettingmetrics bankroll tools enable you to keep track of the amount you have dedicated to a given tipster and see his performance at glance. 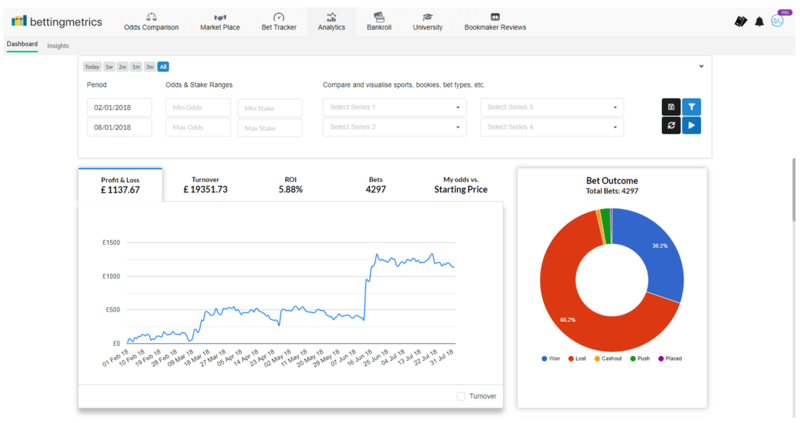 Bettingmetrics market place is unique area of the site where people interested in sports betting can follow world best sports bettors also known as tipsters. Bettingmetrics market place ultimate goal is to connect knowledgeable sports bettors who perceive betting as an investment with other likeminded people willing to learn and follow. Bettingmetrics ensures the quality of the information published on the market place by applying an algorithm which automatically verifies and settles the outcome of 90% of all tips published. The goal is to be able to verify 100% of the content available on the site. The algorithm will be improving on a daily basis as it learns from historical data. Thanks to the new technologies Bettingmetrics are using they offer the lowest possible commission when they connect tipsters with punters. An addition to Bettingmetrics market place is the free monthly tipster competition. It aims to identify talents and help them to become professional sports advisors. Everyone can join the competition and compete versus other leading tipsters for free and eventually take a share of the reward which is £500 in cash. Bettingmetrics is a great complementary product that will take your betting activities to a whole new level. You will have the opportunity to gather all your betting activities in one place, enjoy fast and reliable odds comparison and follow some of the good tipsters. Bettingmetrics software will save you lots of time tracking and analyzing your data and you will be in a situation in full control of your sports betting portfolio. We recommend Bettingmetrics as a perfect complement to Betamin Builder as you can keep track of all the bets generated by our strategies, through the automated bet tracker they offer. Through bettingmetrics analytical tools, you can check which are the bookmakers in which you have better results by strategy, analyse your performance in detail such as best performing market, leagues, odds and much more. Bettingmetrics analytics will highlight and enable you to see what are the best performing odds and stake ranges in your portfolio. You can optimise you money management strategy and maximise the betting profits. Furthermore Bettingmetrics odds comparison feature will help you to place your bets with the best odds on the market and ensure you are betting with value. What is even nicer is that all bets placed via Bettingmetrics odds comparison will be automatically added to your bet tracker and save you lots of time. All this, along with the large number of features that Bettingmetrics offers, will help you improve your analysis based on your strategies results. Finally, remind you that you have an exclusive 15% discount when buying a Bettingmetrics subscription using the coupon BET19. Enough said – it’s free to open an account with Bettingmetrics so there is nothing to lose.